The party's not over yet. From stage to screen to stage once again, Ian Lloyd Anderson and Emmet Kirwan are bringing Dublin Oldschool out for 'one more tune' on the stage of the Project Arts Centre. We caught up with the performers to discuss the show's incredible run - watch the interview above. "For theatre to actually be given a shelf life, shows almost have to come back in order to garner support and gather steam to create demand," says Ian Lloyd Anderson. "This was always on the cards to come back before the film came out." "Many plays entered the Irish canon because they were put on again and again," adds Emmet Kirwan. "They permeate into the popular culture because people have seen them multiple times." Dublin Oldschool follows Jason (Kirwan), a wannabe DJ indulging in a drug-fuelled trip through Dublin, who stumbles across his estranged brother Daniel (Lloyd Anderson), a heroin addict living on the streets. Over a lost weekend, the brothers reconnect over raves, tunes and their troubled past. Outside of the annual trip to the panto, going to the theatre can often seem like a high-brow activity - exclusive to those with an arts degree and an above average pay grade - but with it's 'What's that? Gimme that' attitude and Dublin-centric dialogue, this play appeals to a far more diverse audience. "In one way, that's it's biggest achievement," says Ian. "It draws in people that don't go to the theatre. It's so important, especially for younger people, that their first theatrical experience is positive because if it's not there's a high chance that they won't go again other than a musical that's on in the Bord Gáis." While the film presented a cast of Tallaght talent, a session-friendly soundtrack and shots of Dublin's fair city, the play leans entirely on the talent of its two performers. Despite this, the actors both seem to prefer the intimacy and immediacy of an on-stage performance. "Theatre is like running a marathon. You don't get off stage, you're on it for an hour and a half and that's the only thing you have," explains Emmet. "With this, there's an immediacy in terms of the reaction," adds Ian. "What comes back to you from a live audience - you can't access that when you're on [a film] set." An additional benefit of being on stage? Ian won't have to ditch two and a half stone to play Daniel as he did for the film. "In the play, I'm jumping in and out of loads of different characters, there's no need for me to be in one specific look or state. The costume is one costume, it has to work for all the characters. I certainly won't be trying to shift that much weight for the play," he explained. At first glance, Dublin Oldschool is an indulgent weekend of hedonism, dance music, lines of ketamine and bags of cans. On further inspection, it's a reflection of today's Dublin - warts and all. From homelessness and drug addiction to the capitol's changing skyline, the plot tries to shine a light on Ireland as it truly is. "The film hopefully raises awareness," says Kirwan. "The film can't really change or help homelessness or homeless people or drug addicts but what it can do is humanise those stories." Tickets for Dublin Oldschool at the Project Arts Centre are on sale now. 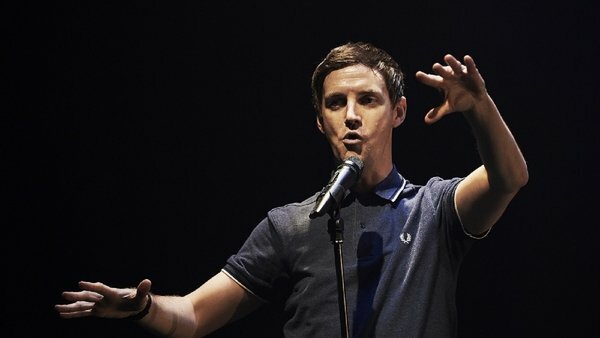 RTÉ Culture have two tickets to Dublin Oldschool up for competition, get the details here.